Pom Pom Lace: Saint Pats Day. Hellooooo! I have been so busy of late that I have put my blog on the back burner and I apologize for that! Uni is just so full on with all the lectures and tutorials then all the reading and homework that has to be done! Also, one must NOT forget about the amazing social life that coincides with tertiary education! I have found that my weekend is no longer Saturday and Sunday but rather Tuesday and Wednesday! Bazaar I know! I took these shots next to my clothes line which is located in a nice safe enclosed area so no one could see what I was doing! Super cheeky cheeky! 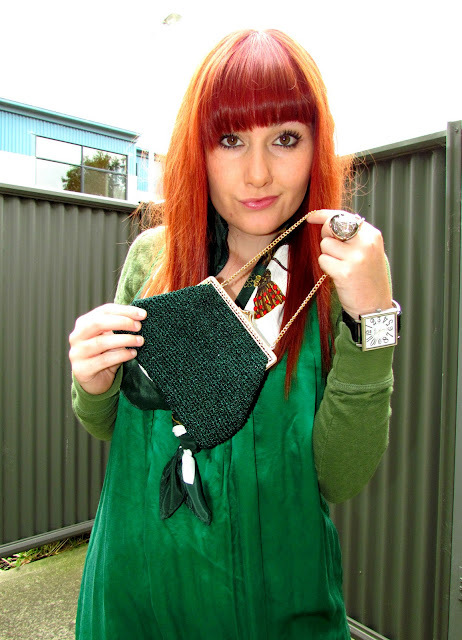 I am wearing a rare green ensemble for Saint Pats day of course and it consists of the following items; Whittner brogues, Sportsgirl sheer tights with bows up the back and a green long sleeve, a vintage scarf and purse, Target watch and Diva ring. My night consisted of heading off to the City and commuting around for three hours with no beverages and high heels (NOT a good combination!). All in all we travelled in taxis, on trams and even used the train! However we never actually managed to find a pub that would fit us! In conclusion my Saint Pats night was a wild adventure with really no destination and a lot a wasted time AND not to mention sore feet! I hope your Saint Pats was better off than mine! still baby steps. I will venture out another day.